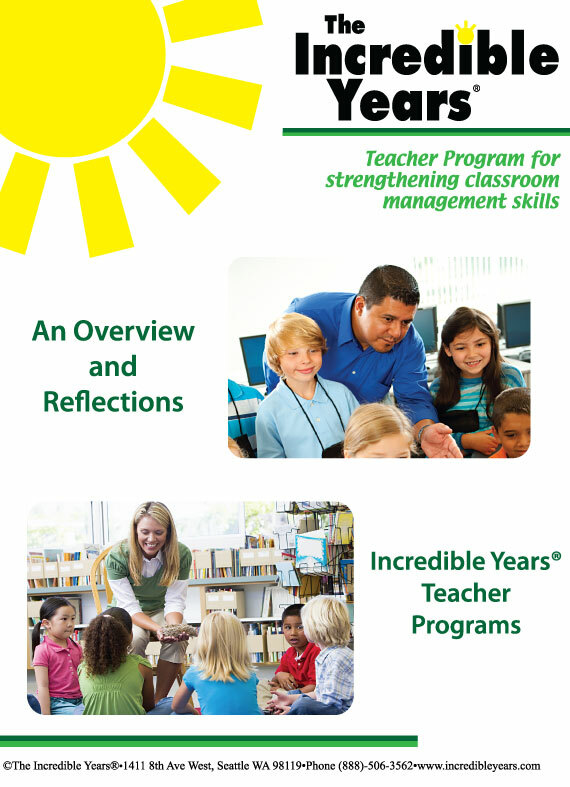 The Incredible Years® (IY) Teacher Classroom Management (TCM) Program is intended to help teachers (of children ages 3-8) strengthen their classroom management strategies. 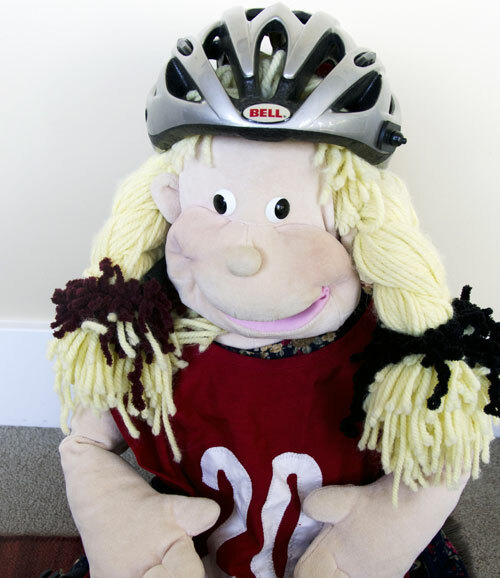 It helps teachers learn fun, new ways to promote children’s prosocial behavior, school readiness, and also reduce children’s classroom aggression and noncooperation. We have a few exciting things that we would like to share with you today about this program! A new article has recently been accepted for publication in the Journal of School Psychology about the IY TCM Program. Judy Hutchings, Ph.D. (in Wales) reported on a randomized control group trial (RCT) with 12 teachers and 107 students. Her primary outcome measure was independent classroom observations that showed that there was a significant reduction in classroom off-task behavior and child negative behaviors toward the teacher as well as to teacher negative interactions with target students. The preliminary results suggest the potential impact of this program on both teacher and child behavior. A second report on the IY TCM Program came out of Ireland by Sinead McGilloway and her research team. Her randomized control group study included 24 teachers and 217 children and used independent observations as outcome measures. These results indicated that teachers who had taken part in the training were using significantly fewer negative classroom management strategies (e.g., fewer threats and less shouting) and they reported using more positive strategies. Observations indicated a significant decrease in emotional symptoms in the intervention group compared with the control students. Further sub-group analyses indicated those children most ‘at risk’ derived the most benefit from the program. A recent follow-up study showed that one year later, teachers reported they continued to confidently use the positive management strategies and described the classroom as a calmer and more pleasant place to work. Satisfaction with the program was very high. Several more RCTs are being conducted with the IY TCM Program at Duke University, University of Missouri, the United Kingdom and Norway. Stay tuned for more results regarding this program! 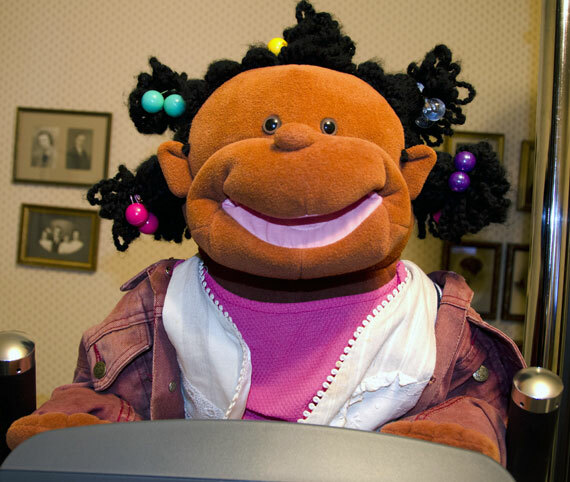 Schools can use these videos to encourage teacher participation in this program. Results from TCM program research show that teachers who participate in the program develop support networks with other teachers and parents, feel confident about their classroom management strategies, and report classrooms with fewer behavior problems. As a result, teachers are able to more academic teaching. Whew! That’s a lot of information to cover! Each segment is under 10 minutes, and we really hope you will take a look at these when you have some spare time. See below for the first segment, “Overview of the TCM Program” OR click here to view all the video segments. Categories: Incredible Years, Programs, Research | Tags: Evidence based, Incredible Years, new research, New Videos, Teacher Classroom Management, Teacher Program | Permalink. 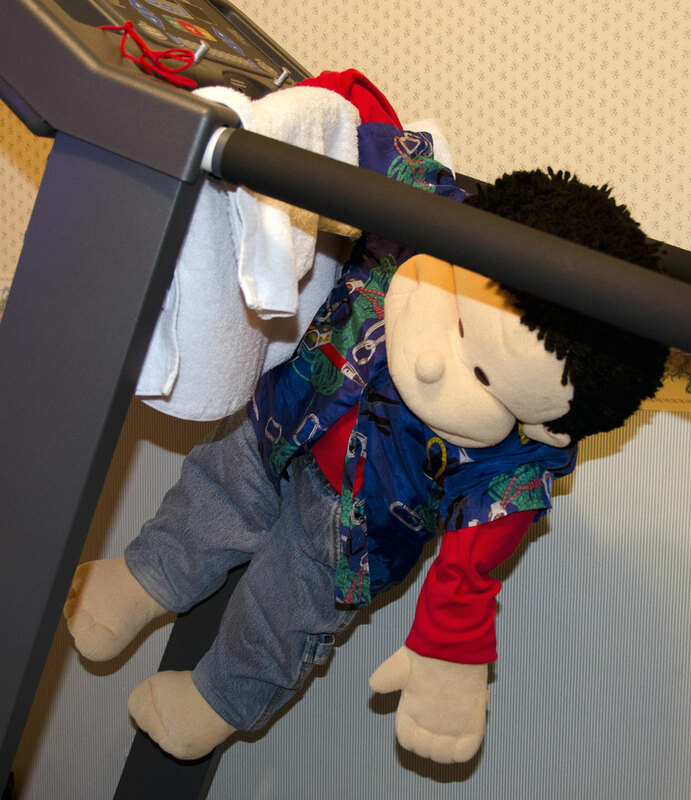 Dina needed a little rest from her fitness regimen so she has enlisted her friend Wally to help her out this week! 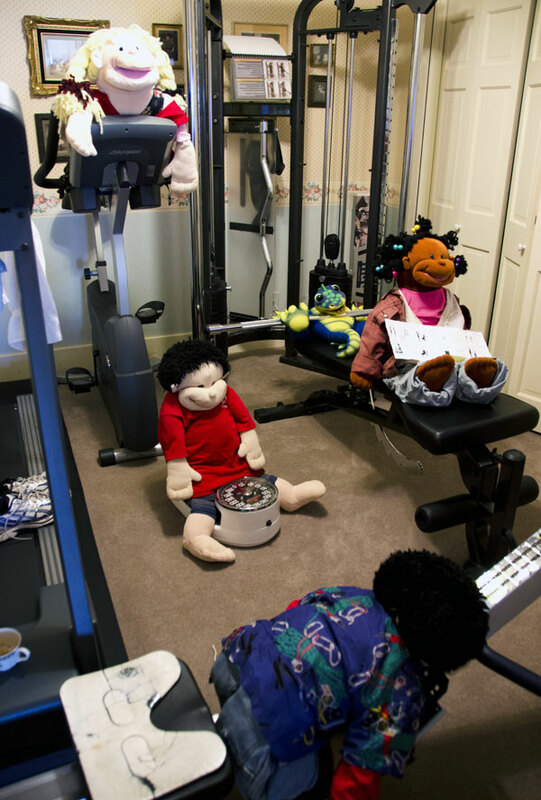 Before we get started, let’s take a more serious moment to highlight a study (published in the Official Journal of the American Academy of Pediatrics) which relates to this fitness series. The study examined youth at high risk for obesity based on income, minority status, and child behavior problems. 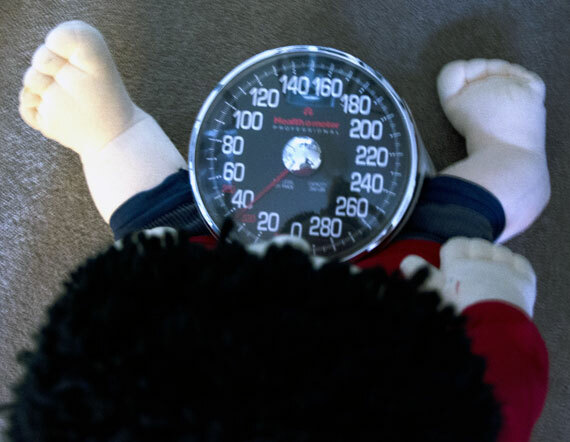 Results showed that early intervention promoting effective parenting led to meaningful differences in obesity in preadolescence. Read the article here! 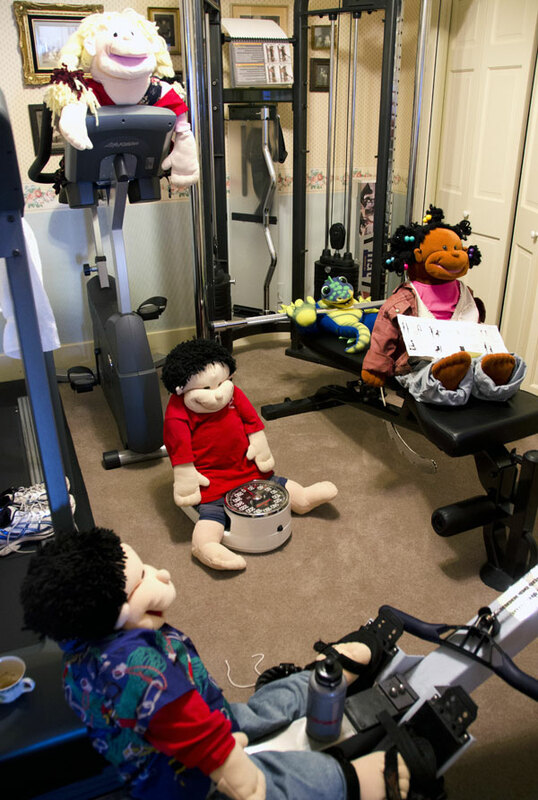 Dina is very tired and sore from all of the exercising she did last week, so she has decided to take today off and instead play “personal trainer” for Wally. 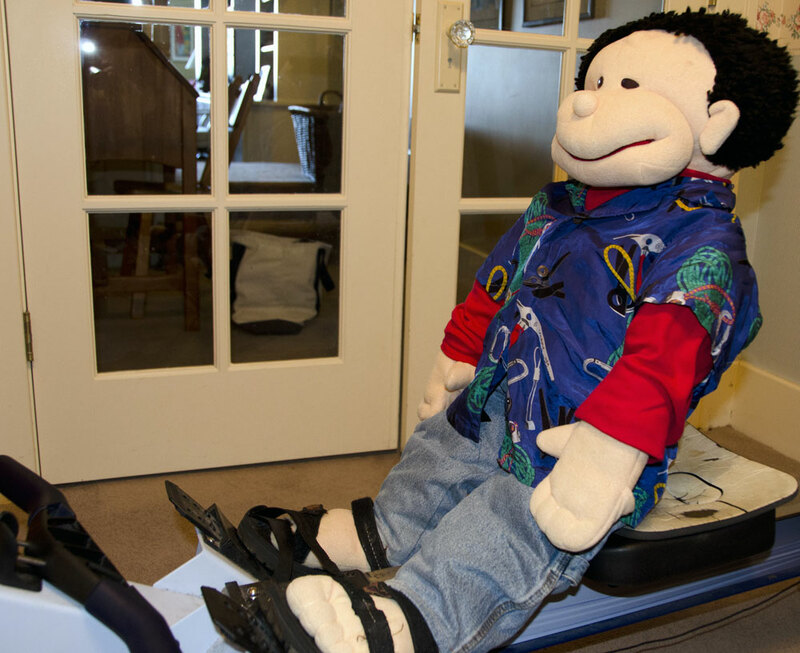 Wally: Hey, Dina, I think I need some help! My mom read some research and she says if I want to be healthy, I should exercise and eat my fruits and vegetables. 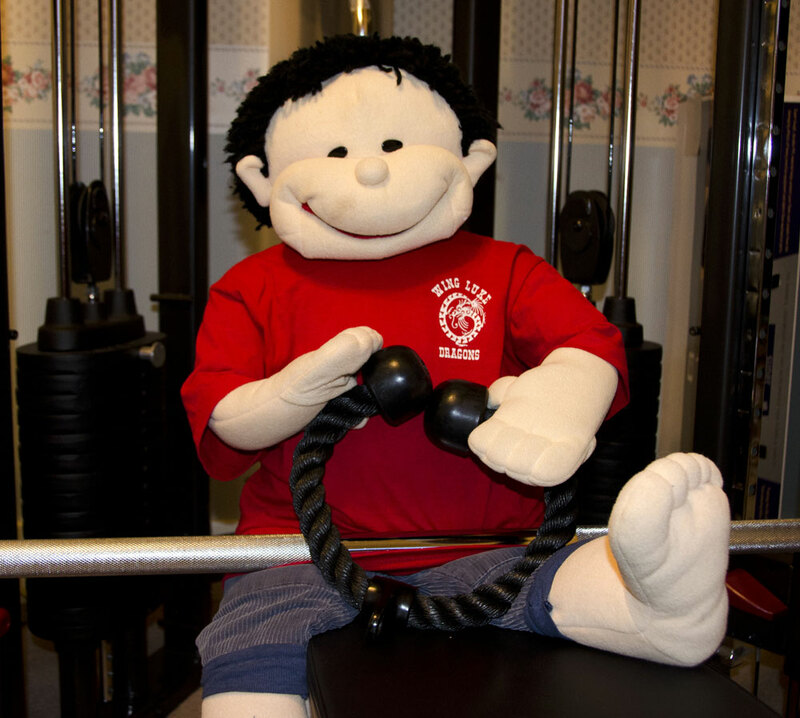 So I think to start, I will work on lifting some weights. I’m not sure if I am doing this right. 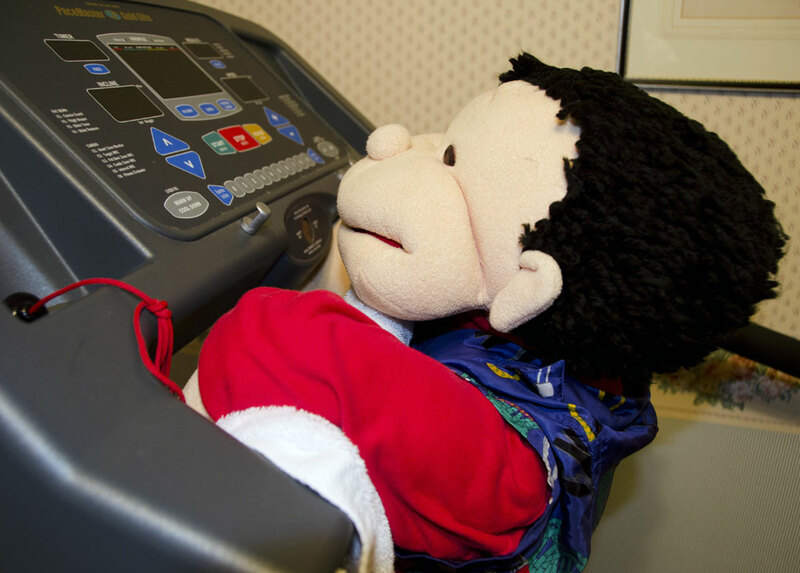 I think I’ll switch to the treadmill and work on my leg muscles! Okay, now I think I have a problem. I don’t think I am big enough to do this! Yikes… CAN I do this?! 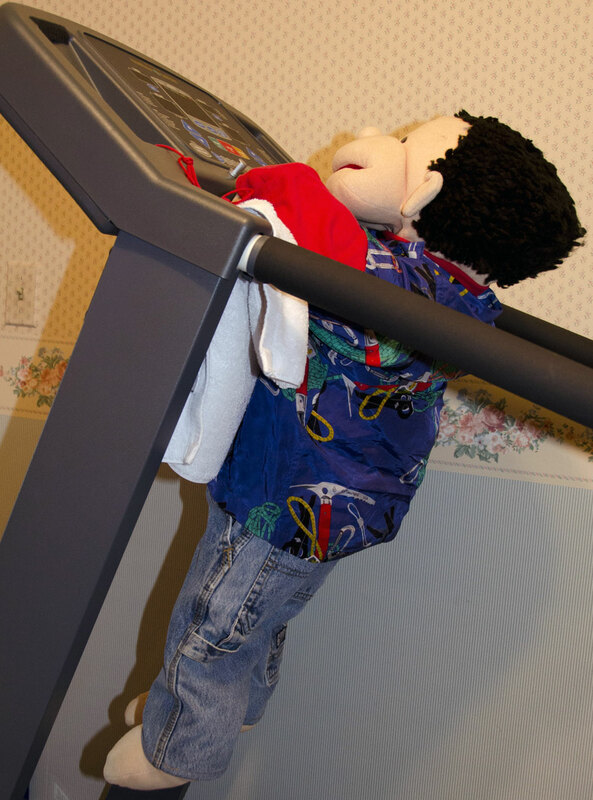 I am definitely not tall enough for the treadmill! 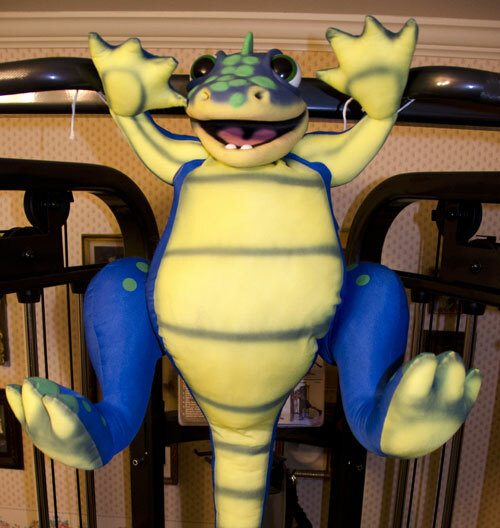 Dina is telling me to hang on and keep trying, because she needs an exercise buddy. I guess I’ll try another solution! 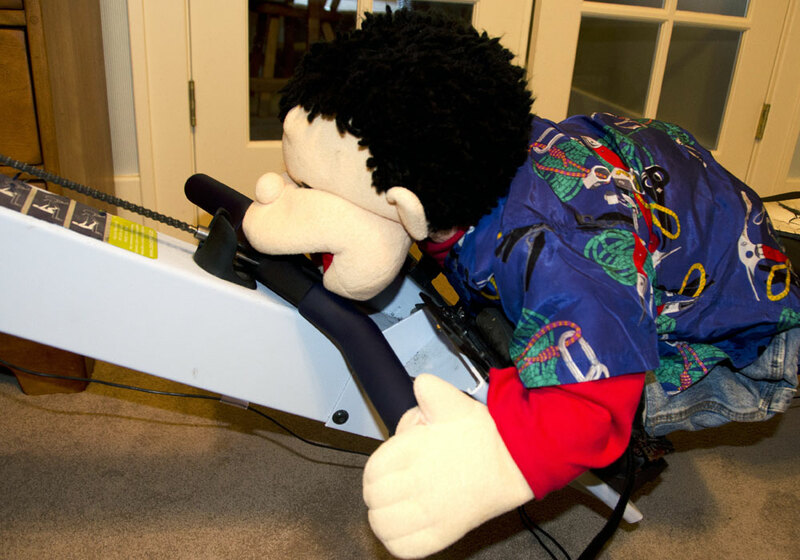 Finally I have found a machine that I think will work for me – rowing! I’m learning there are many different ways to exercise, and the important thing is finding what works for you and your body. Whew. Rowing is work too! Even though I found something that works for me, Dina says it will still take work and persistence. I’ll do a few more, and next week I’ll invite all of our other friends to join too! Categories: Exercise Series, Incredible Years, Just for fun | Tags: dinosaur, exercise, fitness, health, Incredible Years | Permalink.